One of the core competencies of a sniper must not only be shooting with great accuracy and precision. Controlling the factors that enable you to do this is a superior skill. These factors generally include personal concerns like patience and discipline. A sniper must have a strong knowledge of his perspective and situation, far beyond just what he sees through the scope. The formula for great marksmanship skills lies first in managing your stance and breathing pattern and then applying the knowledge of what you read through the scope. The sniper uses all stances depending on the situation. A sniper is sometimes required to move fast and other times at an extreme crawl. And after all this takes place, you are expected to retain your ability to shoot well — you can’t determine when you have to be ready. It is important to have control over the things that affect you and the patience to know the limits of what is possible. It’s obvious knowledge: Just as your stance affects the speed you move, each stance has pros and cons in the results of shooting. Much of this will come across as common sense, but a brief visual comparison helps the pattern become obvious as the effects magnify over distance. 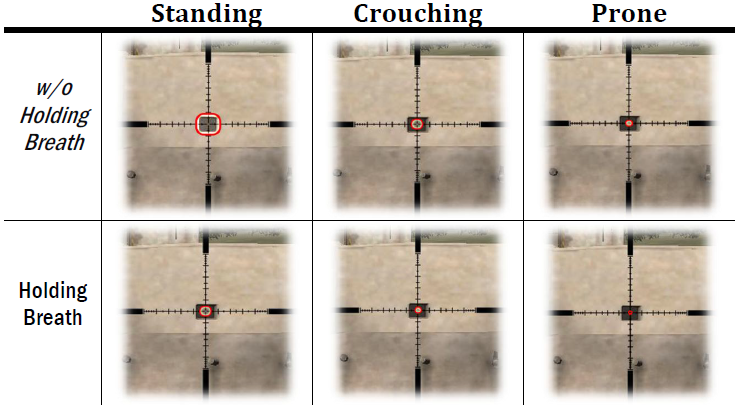 This table features a graphical estimate of the amount your reticle moves or sways while in different stances and breathing. The prone position maintains a near-perfect still reticle with your breath held. NOTE: The steadiness offered by a lower stance can be achieved by holding your breath in a higher stance. This illustrates the shear importance of breathing control rather than solely relying on your stance. There are critical numbers and behaviors related to your character’s breathing in the game. Being aware of these at all times will let you maintain control of what the game is processing, allowing you to have stronger management of your fatigue state overall. Finally, when it comes to the pressures of shooting, do as many have said before: Slow is smooth, smooth is fast. Cliché? Perhaps. Hard to remember in the field? Always. Arma 3™ and Arma 2™ are trademarks or registered trademarks of Bohemia Interactive a.s. - Battlefield 1™ is a trademark or registered trademark of Electronic Arts, Inc. All rights reserved.